I would like to know the benefits and drawbacks regarding to form design of "dependent fields". For example, in my form I have a Marital Status field, and depending on it's value, I need to know the partner document number and partner name. What would be the benefits/drawbacks of not showing the partner fields, and show it on the fly, depending on the selection of the Marital status? What would be the benefits/drawbacks to let the fields disabled on the form, and enable it on other fields selection? Also others solutions for the problem would be appreciated. The form is a Web form for a business Web Application, not a web site. What you are really asking is what is the benefit and risk of progressive disclosure in a web form design. The benefit of using progressive disclosure is that you lower the user's cognitive load by only showing the fields they need to complete their task. As they enter more data, more fields may be required, but they only have to examine and interpret those fields if it is necessary for task completion. In a system designed with progressive disclosure, the very fact that something appears on the initial display tells the users that it's important. Progressive disclosure [...] improves three of usability's five compontents: learnability, efficiency of use, and error rate. The drawback to this approach, however, is in the design and implementation. In order to present the right user interface to the right user at the right time, designers must track multiple types of users and their various states, then map those contexts to an appropriate presentation of features and content. This, of course, is a non-trivial challenge and, as a result, is often done poorly. If the logic is not thought through completely, some users end up with too many options, while others feel they have too few. The good news for you is that the main drawbacks to progressive disclosure are most prominent in applications or complex interactions, not transactional forms. In your case, you are describing required fields that are only required if a particular state exists. You do not have any problem defining what the "right user interface" is for the "right user" at the "right time." Your business rules should clearly answer all of those questions. The implementation challenges with regard to accessibility, page loading, and client-side technologies can be mitigated and tested. Here is a related question that has some additional insight/opinion on this topic. Consider alternatives to either showing or not showing them. A drawback to not showing them is that the user doesn't have an accurate idea of how long a form is based on a quick scroll. Showing them can make a form unwieldy and overwhelm the essence of what you're seeking. 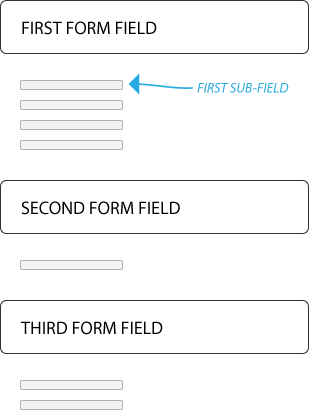 Perhaps a middle-ground approach might work, like the rough image attached where small sub-fields convey that more info will be requested under each main form field, without some of the drawbacks of showing every field right away. Disable fields in a when there’s only one set of fields that are input-dependent. This provides a preview to the user of what they can expect when they select or supply a particular value for the controlling field (marital status, in your case). It’s better than hiding fields because it makes the form visually stable with no strange empty spaces or other fields spontaneously sliding around to make room. It’s better than leaving the fields enabled because users can mentally skip over disabled fields without studying them to see if they apply or not. Hide fields when there’re alternative sets of fields that are input-dependent. That is, if you’re going to replace some fields with others depending on the user’s input, then hide those that don’t apply. Because you’re swapping fields, the form remains relatively stable. It’s preferred to disabling because it keeps the form from getting too cluttered with a lot of fields that cannot all apply at a time. There’re gray areas, as usual. For example if for one selection you have one input-dependent field, but for another selection, you have the four input-depend-fields, it may be better to use disabling to maintain stability and provide preview. The cost in clutter is fairly low. I’ve everything you’d want to know about disabling and hiding* at Controlling Your Controls. Not the answer you're looking for? Browse other questions tagged forms input-fields business-application progressive-disclosure or ask your own question.